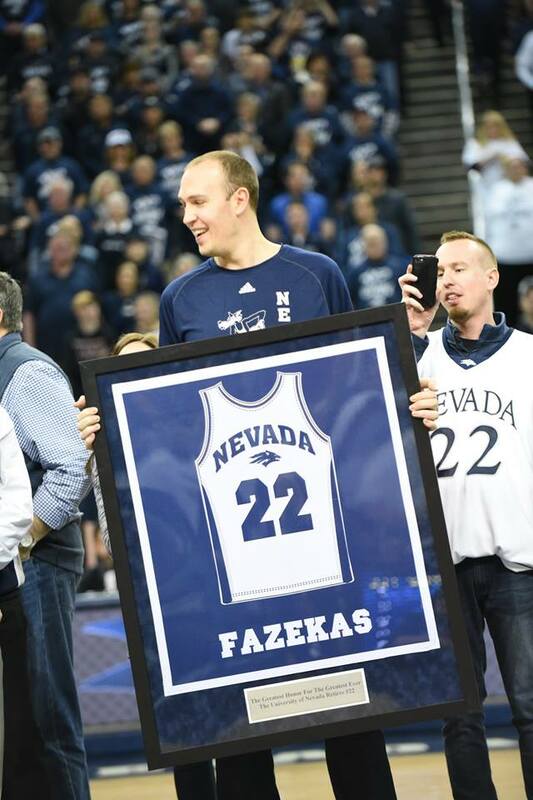 University of Nevada honored Nick Fazekas with a custom banner framed by Maverick Awards during his jersey number retirement ceremony on February 28, 2019. Nick led the Wolfpack to four straight NCAA Tournament appearance. He is the all-time leading scorer for the Wolfpack and holds the single season record for points scored. Congratulations, Nick and enjoy your Framed Banner! 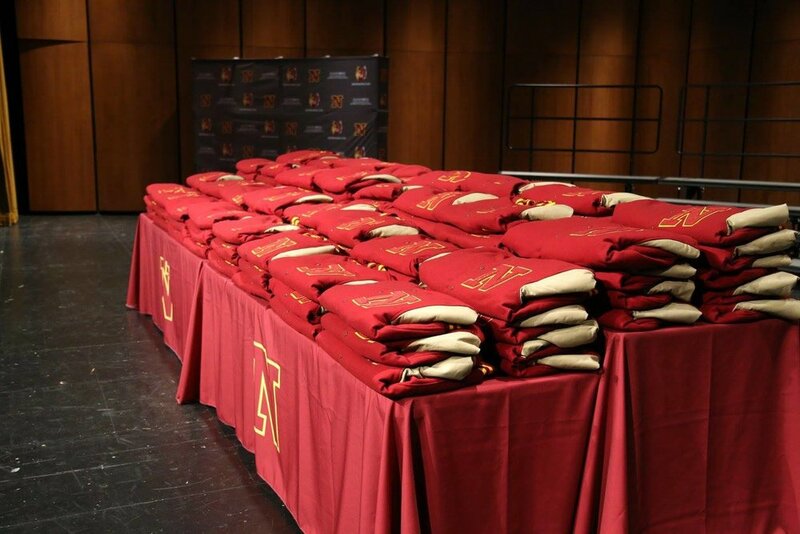 Northern State University recently had their letterman jacket ceremony, and we are so honored to have been of assistance. Rewarding athletes from fantastic schools is what we do best. Thank you, Northern State, for choosing Maverick. We look forward to helping you again soon! Thanksgiving and Our Framed Jersey Special! We're pleased to report that we've finished the buildout on our new frame shop! To celebrate, we are running a framed jersey special. Custom framed jerseys start at $139; the cost include the engraved name plate and lifetime warranty. There are no minimum orders and these awards take about 2-3 weeks to complete. Give us a call at 469-374-9000 or shoot us an e-mail to sales@maverickawards.com so we can get your beautifully framed jerseys into production. The 2016-2017 School Year is About to Begin! We have been quite busy lately gearing up for the 2016-2017 school year. We have so many new patches, which means so many more options for your letterman jacket! The online patch catalog has just been posted, so keep your eyes peeled for something unique and personal to you! It's summertime in Texas. That being said, most people are trying to find ways to cool down, and less focused on a warm jacket. Bring your child for their fitting now, and receive it just in time for cooler weather! With an impressive list of clientele that includes all of the Big 12 schools, Plano-based Maverick Jackets has certainly left its mark as the leading manufacturer of letterman award jackets, blankets and customized athletic apparel. Growing up in Indiana, founder Don Giddens was a venture capitol investor for eight years at a company that would be the precursor to Maverick Jackets. When the original investors decided to pursue other business endeavors, Giddens bought the company and moved it to Plano. The 2015 Big 12 Equipment Managers Meetings were hosted by our good friends at TCU, in nearby Ft. Worth, TX. As part of the itinerary for the meetings, they showed their support for Maverick and asked us to host us a tour of our facility to which we happily obliged. This was a great opportunity for our Big 12 customers and fellow vendors to tour our facilities and get a "behind the scenes" look at what goes into the manufacturing and decoration process of lettermen jackets, award blankets, framed awards and chenille. We are proud of our business and our 18,000 manufacturing facility. We were honored to be able to show it off and this was a very nice show of respect from our Big 12 Equipment friends. Maverick currently manufactures and supplies athletic awards to ALL Big 12 schools. This is a very well done video from our friends at Iowa State Letterwinners Club that gives some insight into the importance and history behind the letter jacket tradition at Iowa State. 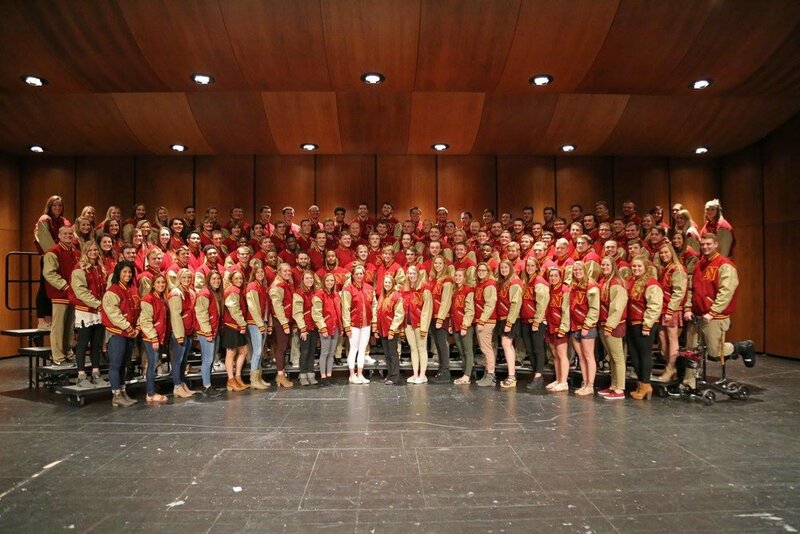 Maverick is the proud manufacturer and supplier of award jackets to Iowa State and we look forward to outfitting many more letterwinners in the future. Maverick Awards is the proud manufacturer and supplier of letter jackets to Virginia Tech University. We would like to congratulate the student athletes who have put in the time and effort to earn their Virginia Tech Varsity Letter Jacket. 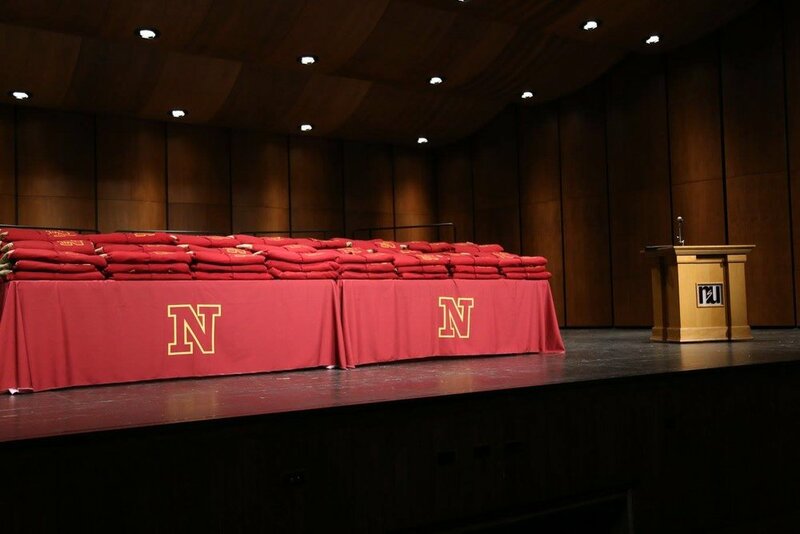 Their achievements were recognized during an inaugural letter jacket ceremony held in McConnell Auditorium on Feb. 2, 2015. At a time when many schools are moving away from a traditional letter jacket award ceremony, it is great to see a school like Virginia Tech begin the tradition for their hard-working student athletes. 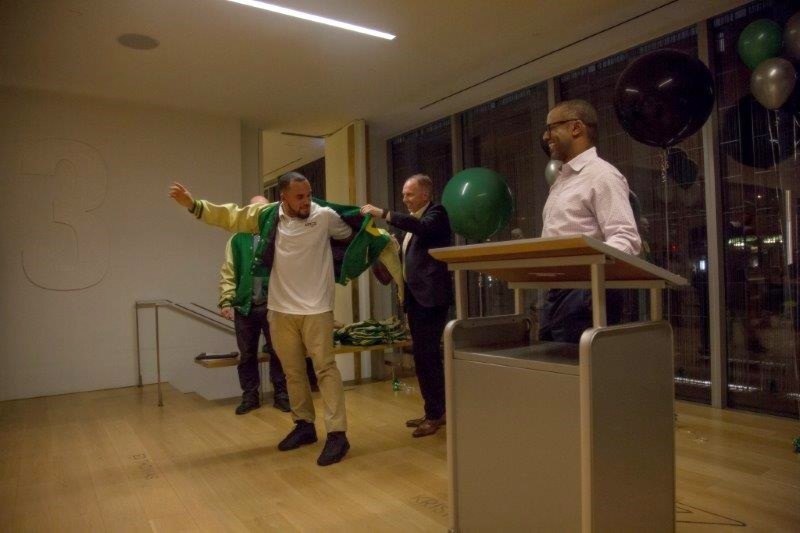 We hope more colleges and universities follow their lead and keep the letter jacket tradition alive! At the 2014 Hall of Fame ceremony, Michigan State honored members of the Michigan State Hall of Fame with the gift of a letter jacket. The left chest chenille bears the distinction, "Hall of Fame". Our friends at Michigan State were kind enough to send along a "thanks you" card with this photo. 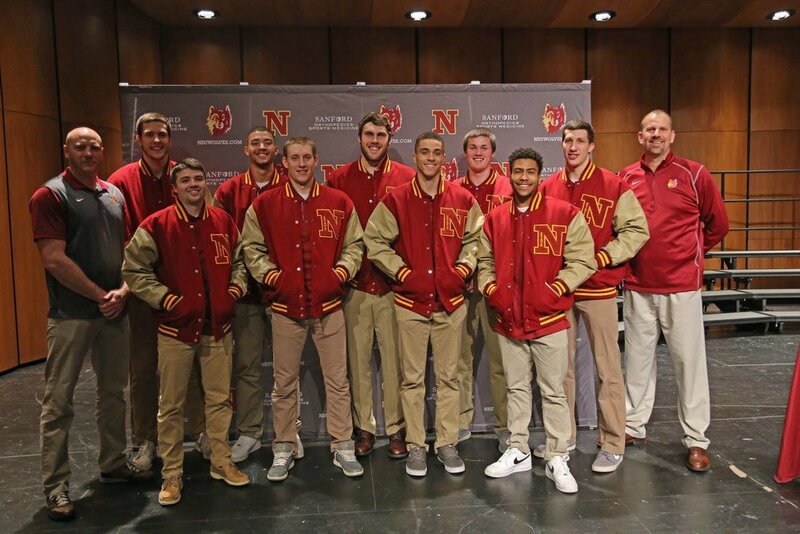 It is great to see such an exceptional group of athletes proudly wearing their Maverick Awards letter jackets. As a manufacturer, we are so focused on making the highest quality awards (along with the delivery and service), that we sometimes forget that our awards are part of something special.